In June, my husband and I travelled from Gloucestershire to East Sussex, to stay with my sister and her partner. It’s always a joy to spend time with them, but on this occasion “Fun” was not the only reason we made the trip. I am currently writing a book that has an archaeological theme. It as yet has no title, but the elevator pitch is ‘Educating Rita meets Time Team’! My sister, Jan, has been on many archaeological courses and, through the Sussex School of Archaeology, is in touch with what’s going on in her locality. I wanted to get a hands-on feel for the practicalities of field archaeology, so I’d asked her if she knew of any upcoming digs which invited interested amateurs to join in. Stock image of the site when the turf was first removed. Jan identified a day-long introductory course called ‘Excavation Techniques for Beginners’ sited at the Plumpton Roman Villa Excavations. It sounded perfect and we both signed up for it. No longer in the first flush of youth, I am now rather stiff and creaky. As the day approached, I began to worry. Jan kept stressing that working on a dig is very hard. “Knackering” is the precise term she used. I was also a bit anxious about the weather. This is England after all. The prospect of trying to dig heavy, wet earth, bundled up in rain clothes, was not appealing. Nor was the idea of its opposite - getting scorched. I also assumed there’d be little prospect of actually finding anything. Surely they wouldn’t set a bunch of amateurs loose on an area that was likely to give up many - if any - treasures? I imagined myself wet, muddy, exhausted and in pain, scrabbling waist deep in a barren trench. I planned on wearing cargo pants (to give me lots of roomy pockets for my notebook, camera and pen etc. ), and a shirt over a light-weight, long-sleeved Tee shirt. Optimistically, I added a brimmed hat to the ensemble. If it was sunny I could strip off a layer without the danger of getting burnt, and I could protect my head. But if the worst came to the worst and it was wet, I included a light-weight hooded water-proof. All eventualities covered, we set off. Fortunately it was the sunhat I needed. The whole area of the site is quite large. A corner of it, now covered in tarpaulins, was thoroughly excavated last year but, over the great majority of the site, only the surface turf had been removed. 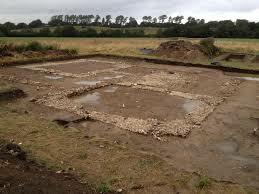 Clearly visible were the changes in colour and texture which indicated the location of old walls. There were about ten of us and, after an overview of the project and a demonstration of the techniques we were to employ (including the use of the mattock), we were divided into pairs and a strip was allocated, well away from the 2014 excavations, or the patterns on the surface of the site which marked the outline of the original structure. Each two-man team was required to stand a metre or so in from the perimeter and we were told to work slowly back towards the edge, keeping in line with the other teams. One of the pair had the mattock, swinging it gently in backward strokes - just taking off the surface of the earth to a depth of around three or four centimetres - and the partner’s task was to collect the loosened earth and examine it. Anything that looked interesting was to be put to one side in a tray, and in due course shown to the team leader, Annalie Seaman MA, and the rest tipped into a bucket, which had to be regularly emptied onto the already impressive spoil heap built up from the scalping of the turf and the 2014 excavations. I chose to wield the mattock first, and my sister was the collector and identifier - then we planned to change places, in order to use a different set of muscles. As I’ve already said, I had low expectations of finding anything at all, other than soil, stones, more soil and worms, but, from the dislodged material of my very first mattock stroke, Jan picked out a rim section of a pot. And we weren’t the only ones to unearth objects of interest. All along the line, artefacts were being found - there were fragments of shell, shards of pottery, tiles and a terracotta material, which looked like bits of brick. trowel) and we went back to the line where we’d originally commenced the mattocking. Side by side, the pairs worked backwards again, but this time gently scraping, and then brushing, another layer of earth from the surface. And the finds kept coming for me and my sister. None of the fragments were larger than the palm of my hand, but most were far smaller. By the end of the day we had penetrated the surface by no more than six to eight centimetres, so it was evident there was far more still to be found in this area of the site. When it was time to go home, I had to walk away from my own strip, leaving a tile with a ridge along one edge (round 10 cms), as well as various bits of brick, protruding tantalisingly from the ground. I am convinced that the productivity (if I can put it like that) of the area we were working on, came as a surprise to Annalie. 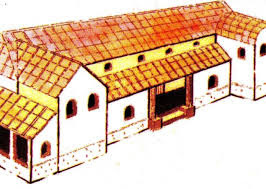 She theorised, given the roof tiles and Roman ‘brick’ we were finding , that the villa had toppled towards our corner of the site. From the way she talked, I guessed it was a scenario previously unsuspected. And while we were there, the ‘official’ metal detectorist working on the spoil heap even found a Roman silver coin. 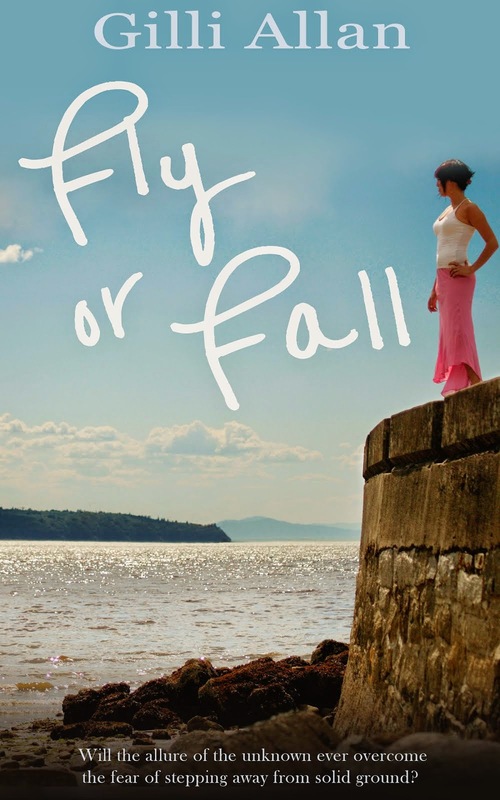 Many of life’s big events fall short of my expectations. I am a writer after all, and I doubtless build them up, imagining everything bigger, brighter, more glittery and exciting than they could possibly be in real life. I felt for two of our number for whom the archaeological excavation beginners experience had clearly been underwhelming. Not only did this pair of young teenage girls appear to be incapable of following Annalie’s instructions, one of them expressed the hope that she would find a skull, and the other thought she’d be allowed to take her finds home. For much of the time after lunch they skived off, lying gloomily in the sun, and tapping into their hand-held devices. 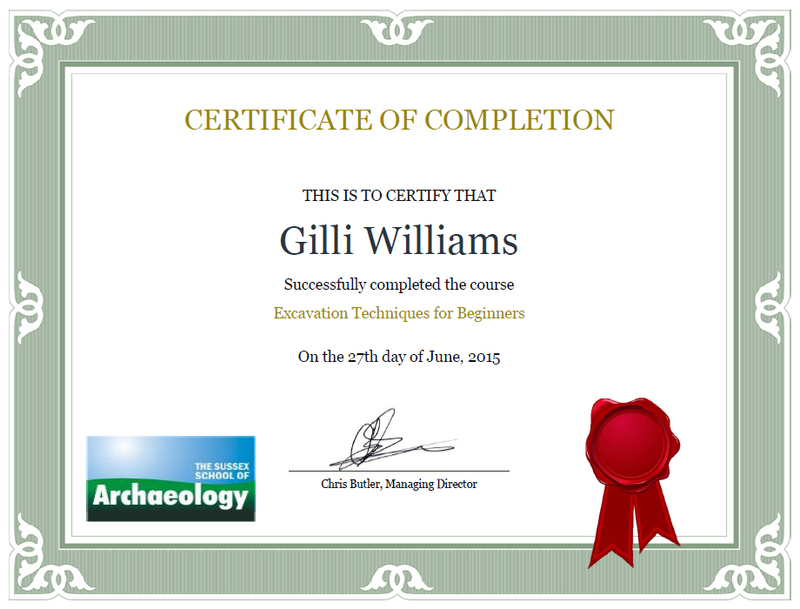 But for me, being a real archaeologist for the day greatly exceeded my expectations. It was informative, rewarding and thrilling. The sun shone and my own ‘old bones’ stood up very well to the exigencies I put them through. I even ended up with a certificate! 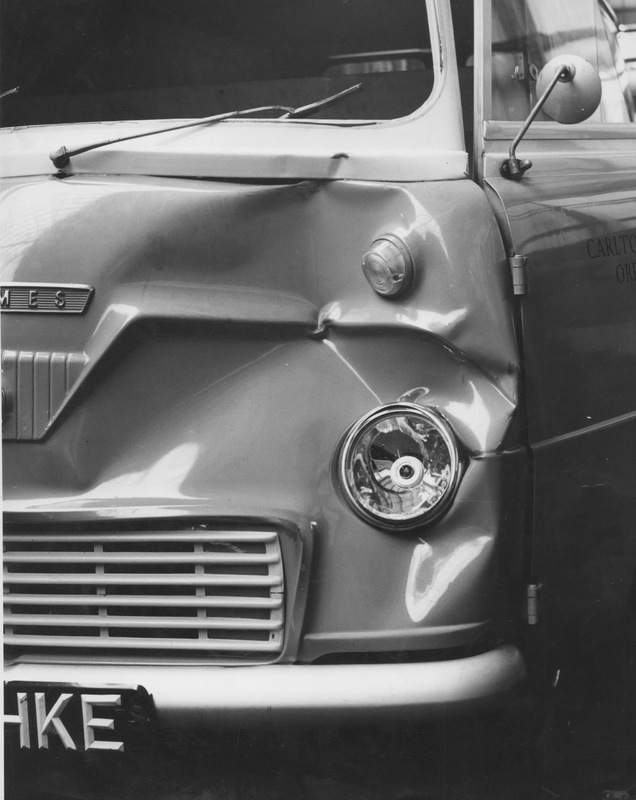 During the summer of my thirteenth year, I was knocked down by a Thames van right outside my house. It was a serious accident. Apparently there was a lot of blood. But a police car happened to be cruising the area, and it came upon the scene just after it happened, and radioed it in. I was carted off to hospital very swiftly and actually made a fairly speedy recovery (although I still blame my creaky knees on being hit by that van, and the dis-function of my thought processes is obviously due to undetected brain damage!). But ever after, my family would tease me that it was that knock on my head that ‘turned me on’ to boys. It’s certainly true that I’d not noticed Stuart Ollerenshaw, who lived a few houses up from us, or Richard Early, who lived near the bottom of the road opposite, until after the smash. But I actually remember having an eye for a ‘good-looker’ for some years before my argument with the van. I always say that Elvis Presley was before my time, much to the outrage of women only a few years older than me. I have to explain what I mean. Elvis was already a presence in pop culture when I began to take an interest in such things. Because of that, he somehow didn't belong to me. He was old hat. I discounted him. I didn’t even like Cliff Richard. The way he sneered when he sang obscurely embarrassed me. 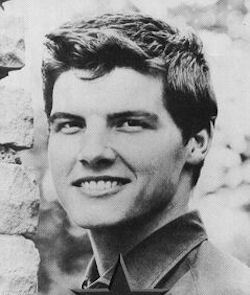 The pop star I did have eyes for was the wholesome Jess Conrad - dark-haired, chisel-jawed, and a wide, pearly and engaging smile. It was just a pity he didn’t have much of a voice. And, after watching The Guns of Navarone on a rainy afternoon on holiday in Cornwall, I fell for the American actor and singer, James Darren. These two were pinned up, side by side on the drop ceiling above my bed. 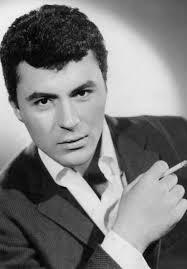 James Darren was also good looking, in a dark-haired, sculpted style. I eagerly bought his records, which I’d been unaware of until I spotted him in The Guns of Navarone. But the description gravelly hardly did justice to his singing. You had to love the man first before you could love the voice. He wasn’t really a top of the tree pop star then, and it’s not altogether surprising he is not played much (or ever?) on Radio 2 now. As a child, growing up, what most influenced my world was the television. And what was on TV - morning, noon and night - swamping both channels? Cowboys! I blame this blanket coverage for making me intolerant of watching a Western feature film now, no matter how many Oscars, or review stars it’s been awarded. I’ve had it with deserts and cactuses and buttes and saloons and tumble weed! I over-dosed years ago. But in the days of my addiction I was in thrall to this world. 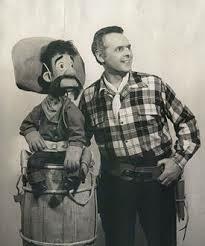 I even had a ‘Hank’, a cowboy ventriloquist’s puppet with a big moustache. (Anyone else remember Hank ? He was on children’s TV, and the show was a mix of puppet and cartoon.) But I was never romantically interested in Hop along Cassidy, Roy Rogers, The LoneRanger or The Cisco Kid. The protagonists in these shows seemed old to me, and the ‘romance’ was in the world created and the eponymous heroes' weekly exploits, not in anything heart stirring. 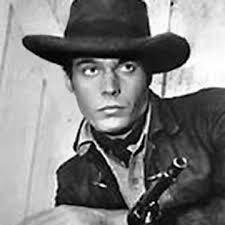 The first adult TV series I recall that did disturb strange feelings in me, was Wagon Train. 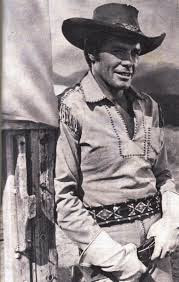 In my view the hero of Wagon train, was the scout, Flint McCullough, played by Robert Horton, and if an episode didn’t revolve around Flint and his adventures (romantic and manly) I was always deeply disappointed. Looking at him now I can’t really get what I saw in him. I guess my hormones were practising. 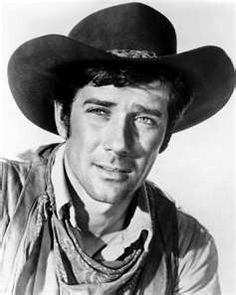 I definitely know what I saw in the dark, chisel-jawed Jess Harper, played by Robert Fuller, in Laramie. I can still see it now. Looking back through the mists of my memory, I recall that Jess had a cohort in the story, but he was blonde and fat faced and therefore of no interest to me. Without Googling, I wouldn’t have remembered that he was Slim Sherman, played by the actor, John Smith. Rawhide was the next Western series that made an impression. 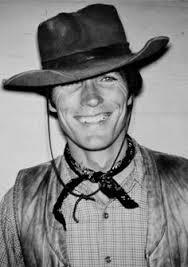 For many years I claimed to have ‘discovered’ Clint Eastwood, who played Rowdy Yates, because in my family I was alone in my admiration. So when he went on to bigger and better things it was somehow down to me. There were many further ‘cowboy’ series, which we sat and absorbed uncritically as a family, and I am sure people will have their own favourites, but no matter how hard I tried (and I always did try) I could never conjure up the same enthusiasm for any of the characters in Bonanza, nor in any of the other similar Western formats. Not, that is, until Gunslinger. Gunslinger was a very short-lived show, much to my chagrin, and only one series was made, presumably because it was not so universally popular with the U.S. audience. Googling the show it seems it was considered darker, more nuanced and ambiguous - and that is probably why I loved it. More importantly, I instantly fell for the reformed gunslinger of the title - the most chisel-jawed and moody of all my cowboy crushes. His name was Cord, played by Tony Young, and he “worked undercover for the local army garrison commander, to help keep peace in the territory”. All too soon, Gunslinger finished, and that was the end of my cowboy heroes. It was only after the accident, and that knock on my head, that the Beatles appeared on the horizon. And with their arrival, the pubescent girl’s need for heroes to worship, really kicked-in hard and heavy. I could go on, listing the pop stars who floated my boat after the initial heat of my Beatles obsession died down a bit, but I won’t. 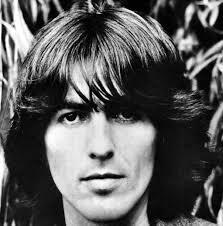 All I will say is that I am still drawn to slim, dark men, with high cheek bones and a chiselled jaw (so it won’t surprise you to learn that George Harrison was my favourite Beatle). Now, in my maturity, I can appreciate, and write about, men with a variety of different attributes. After all, a handsome face isn’t everything. It’s far more important to love the man first, and then the way he looks - the precise shade of his light, reddish brown hair, the flecks of marmalade and green in his hazel eyes, his freckles - become beloved too. But it’s been an interesting exercise to look back at all those heroes - a lot of them in cowboy hats - and recall with ease what I saw in them. NB. 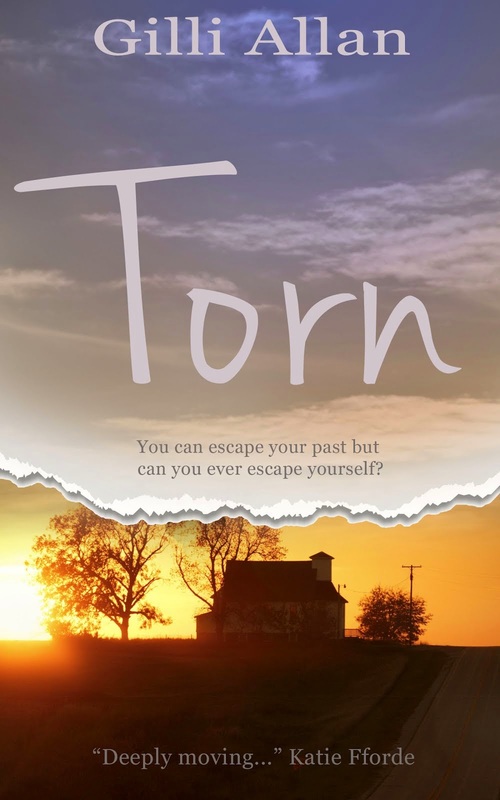 There is another story to be told about one of the policeman in the car that came upon my childhood accident, but I’m saving that for another day.